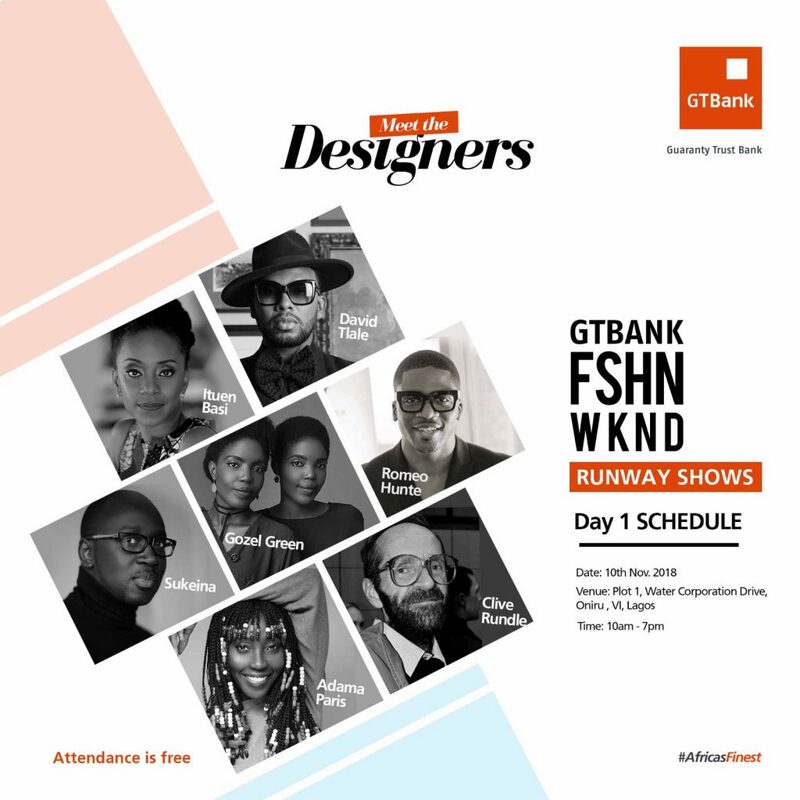 Hard work, creativity and passion, punctuated by the clicking of heels, define a single moment on the GTBank Fashion Weekend Runway Show. On Saturday, November 10th, and Sunday, November 11th, 2018, thousands of guests will be entertained by this single moment as indigenous and internationally renowned designers showcase their brands on the runway. Omar Salam is the Senegalese-born designer behind SUKEINA, a global fashion brand worn by the some of the best dressed women in the world. He studied fashion at the prestigious Parsons School of Design and has created 8 exquisite collections which strike a resemblance to wearable art. Romeo Hunte is a self-named lifestyle brand. His collection consists of outerwear pieces that have a mix of cool-girl denim designs and everyday style for the fashion forward-guy. Romeo’s design has been worn by Hollywood A-listers like Beyoncé and Gabrielle Union. Sylvia Enekwe and Olivia Jude-Okoji are the brains behind the budding Label, Gozel Green, established in the year 2010. Growing up in the eastern part of Nigeria, Enugu, they were tremendously inspired by their art-loving parents, and their immediate environment. These inspirations birthed Gozel Green and thus paved way for artistry, originality and timelessness as their forefront design aesthetics. Clive’s creations are well-known both locally and abroad, adored by bold and fearless women for their charismatic charm. Today, Clive Rundle has established his name as one of the forefathers of contemporary fashion design in South Africa. Adama Amanda Ndiaye is the brain behind Adama Paris, which celebrates the multicultural, elegant, and versatile woman. Her work has been featured in magazines sunch as Vogue, Elle, CR Fashion Book and worn by celebrities like Teyana Taylor. Proclaimed as South Africa’s kind of Fashion, David Tlale designs are known to employ unpredictable use of fabric, color and texture, David’s designs have been grazing the runways of NYFW from 2008 till date.